Everyone wants to party in style whether it’s a simple dinner date or a festivity planned with friends. Reserving a party bus with Hamilton’s Limo and Car Service is a perfect choice for times you want to celebrate with others. With Hamilton’s Limo and Car Service, you not only enjoy an exciting luxury ride, you and your friends are transported safely by an experienced chauffeur. Our party bus vehicles are fully enhanced limos with all the luxury features you expect. They seat 14 passengers comfortably and are equipped with enhancements like LED lighting, laser and strobe lighting, full digital audio systems with subwoofer, mirrored star gaze ceilings, under seat lighting, and luxurious leather bench seating. Whether you are traveling around New York City or to and from New Jersey, our party bus service is available. Our chauffeurs know the area completely. We also provide service to and from Morris, Essex, and Union counties and surrounding areas. When you reserve a party bus from Hamilton’s Limo and Car Service, you can expect our chauffeurs to make the night as fun and comfortable as possible. You and your friends will enjoy traveling around town in a nightclub on wheels while our driver takes care of everything. Our expert limo drivers are hand-selected, screened, and trained. Established in 1996, we have earned a great reputation throughout New Jersey and New York City as being reliable, prompt, affordable, and professional. 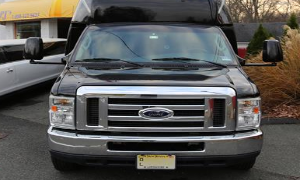 Our NJ car company is bonded and insured to protect the vehicles and passengers. At Hamilton’s Limo and Car Service, quoted party bus prices are all-inclusive. There are no extra fees tacked on later. Many party bus services will add on toll fees, parking fees, fuel charges, taxes, and gratuities that surprise customers. Our pricing is transparent, with no hidden fees whatsoever. Reservations are easy. Just call us and reserve your party bus today or get a quote and make a reservation online. If you are looking for a professional car and limo service in NYC or New Jersey then please call 862-520-7433 or complete our online request form.